(Nanowerk News) Just behind the University of Arizona's Bear Down Gymnasium, a house-sized frame of crisscrossing steel tubes is mounted onto a swiveling post in the concrete bottom of an empty swimming pool. The tracker, as the structure is called, supports two curved, highly reflective glass mirrors, each measuring 10 feet by 10 feet. 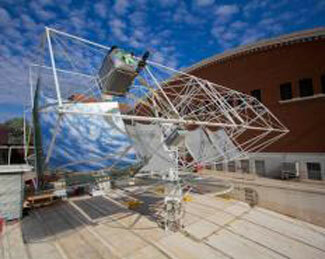 The tracker is "on sun," converting the hot Arizona summer sun into electrical power. "We use mirror-making technology we developed at the UA to make highly concentrating solar mirrors," said Roger Angel, Regents' Professor of Astronomy and Optical Sciences and director of the Steward Observatory Mirror Lab. "Our technology holds the promise of getting the price of solar energy down to where it can be used on a large scale without depending on subsidies and be competitive in the electricity market." The Department of Energy recently granted $1.5 million to Angel's research group to extend the mirror-making process to the so-called thermal method for making solar electricity. The mirror-making process will be optimized for cost-efficient mass production. The group has already patented its method for making dish-shaped glass mirrors. "Most mirrors used in solar power plants are used for thermal generation by focusing light onto a long pipe used to heat water into steam," Angel explained. "This requires the mirrors to be shaped like a cylinder. What we have learned here at the Mirror Lab is how to bend the glass to high accuracy so as to focus to a point or a line." The grant involves a collaboration with a commercial manufacturer, Rioglass Solar in Surprise, Ariz., which churns out cylinder-shaped glass mirrors every 20 seconds. "Much of what we have learned about making telescope mirrors carries over," Angel said, "how to make them, how point them and how to make them efficient at collecting light. But for this technology, we have to do things ten thousands times cheaper and ten thousand times faster than we do for a telescope." Angels' team plans to build a furnace that works like a giant toaster oven. Within in a few seconds, heaters placed above the flat sheet of glass turn glowing red, and within a minute the glass will soften and sink into the mold placed underneath. "Our students are the lifeblood of this project," Angel said. "Currently they are working on ways to convert the light focused by dish mirrors into electricity using photovoltaic cells." The mirrors focus sunlight onto a 5-inch glass ball and from there to a small array of 36 highly efficient photovoltaic (PV) cells, developed originally to power spacecraft. They convert a broader range of the solar spectrum into electricity than regular cells. The ball lens is coated to maximize transparency for the incoming rays. Angel said that an undergraduate student working in the lab, Ivan McCrea, discovered a new way of coating the lens for very high transmission. Another student, Blake Coughenour, a graduate student in the UA's College of Optical Sciences, is working on the optics to more efficiently couple the dish-collected sunlight to the cells. "Because we are focusing highly concentrated sunlight onto the cells, we had to design an effective cooling system for the cells," Coughenour said. "Otherwise, they would melt within seconds." A unit of fans and radiators – not unlike the cooling system in a car – is attached to the solar cell array, keeping them about 36 degrees Fahrenheit above ambient air temperature. "The tracker is fully automated," Coughenour explained. "The system wakes itself up in the morning and turns to the East. It knows where the sun will rise even while it's still below the horizon. It tracks the sun's path during the day all the way to sunset, then parks itself for the night." In recent test runs, the prototype module generated 2.5 kilowatts of electricity, enough to meet the power demands of two average U.S. households. "By using mirrors to focus on small but super-efficient photovoltaic cells, we have the potential to make twice as much electricity as even the best photovoltaic panels," Angel said. How does the solar technology compare to non-renewable energies? Angel said an array of sun trackers on an area measuring about 7 miles by 7 miles would generate 10 Gigawatts of power during sunshine hours. "You could make the same total amount of electrical energy as the Palo Verde Nuclear Power Plant near Phoenix, the biggest nuclear power plant in the country." Unlike conventional power plants that use steam to power turbines, Angel's photovoltaic prototype uses no water, making it especially suitable for desert regions. The materials are cheap to produce and by concentrating sunlight with mirrors the plant's footprint is smaller than that of PV panel-based plants. "We have laid the foundation for a structure that meets all the criteria you would want to see in an energy technology that is kind on the planet, doesn't emit carbon dioxide and doesn't consume water," Angel said. To bring the solar concentrating technology developed at the UA into production, Angel together with several partners founded REhnu, LLC in 2009. Former UA President John P. Schaefer serves as the company's president, chairman of the board and CEO. Angel's team is continuously working to improve the technology and through the new award will extend its application to thermal as well as photovoltaic generation. Coughenour said: "What is cool about our group is that we get to build the technology, take it out into the field and see how well it performs, and then go back to the lab and make the necessary adjustments. Each time, we learn more and more, and optimize again and again. We are at the cutting age, and that's lot of fun."